VANCOUVER, BC--(Marketwire - October 13, 2010) - Ostara Nutrient Recovery Technologies Inc., a global leader in nutrient recovery solutions, announced today it has been named to the prestigious 2010 Global Cleantech 100, produced by the Cleantech Group, providers of leading global market research, events and advisory services for the cleantech industry. The list is produced as part of the Global Cleantech 100 program, run in collaboration with the Guardian News and Media. The Global Cleantech 100 is unique in that it highlights the most promising private clean technology companies from all around the world, those companies which are the most likely to make the most significant market impact over the next five to ten years, in the eyes of the world's cleantech experts. Ostara's Pearl® Nutrient Recovery Technology recovers nutrients such as phosphorus and ammonia from wastewater streams and transforms them into a high-value, environmentally-friendly commercial fertilizer marketed and sold as Crystal Green®. Ostara currently has three commercial facilities in North America: Clean Water Services' Durham Advanced Wastewater Treatment Plant in Tigard (Portland), OR; Hampton Roads Sanitation District's Nansemond Treatment Plant in Suffolk, VA; and, York Wastewater Treatment Plant in York, PA. Ostara recently announced a partnership with Thames Water to construct a commercial Nutrient Recovery Facility at Thames Water's Slough Sewage Treatment Works, which will be the first facility to recover phosphorus from wastewater in the UK. Ostara also recently announced a partnership with the Madison Metropolitan Sewerage District to build a commercial Nutrient Recovery Facility in Madison, Wisconsin at the Nine Springs plant, which will feature two newly-designed Pearl 2000 reactors -- providing the capacity to produce 1,300 tons of Crystal Green per year -- the largest Pearl system to date. "The second Global Cleantech 100 shines a spotlight on which companies and which technology areas the global innovation community is currently most excited about, from a commercial standpoint," said Richard Youngman, Managing Director, Europe & VP, Global Research at Cleantech Group. "There have been significant changes since 2009: more Asian companies and less renewable energy generation companies attest to the growing diversification of cleantech innovation. Cleantech is a broader phenomenon than just clean energy. The wider issues of resource scarcity are starting to gain attention and traction." Ostara's technology addresses the global issue of declining reserves of phosphorus needed to grow the world's food supply. Ostara's technology recovers this precious nutrient from wastewater -- conserving a dwindling supply -- while helping to reduce the carbon footprint by producing a high-value fertilizer through an energy efficient process. Furthermore, the fertilizer -- Crystal Green -- releases slowly, thereby reducing nutrient run-off and pollution of adjacent waterways. "The Global Cleantech 100 list represents the most rigorous, serious attempt made yet to provide a scorecard of the progress that is being made by cleantech companies. This year's expert panel involved a greater level of corporate participation than last year's, and we also saw an increased presence of companies from China in the Top 100 list -- both trends that we at VantagePoint see as critical signs of the times," commented Stephan Dolezalek, the CleanTech Group Leader at VantagePoint Venture Partners. VantagePoint, for the second year in a row, had more investee companies in the 100 (including Ostara) than any other investor. "We are very proud to be elected to the prestigious Global Cleantech 100," said Phillip Abrary, Ostara's president and CEO. "It is a testament to an amazing team at Ostara that has collectively transformed a promising technology into a viable business. Our technology is not only helping preserve a non-renewable resource by producing a fertilizer from a sustainable source, but is also providing a solution for wastewater treatment plants to recover otherwise polluting nutrients, and turn them into a valuable product, and further protect local waterways." The Global Cleantech 100 list is derived by the Cleantech Group, which draws on its own data and research, and combines it with the weighted qualitative judgments of both hundreds of cleantech industry insiders, and the viewpoints of a 60-strong, international expert panel. To qualify for the list, companies must be independent, for-profit, cleantech companies that are not listed on any major stock exchange. For the Global Cleantech 100, 4,616 nominations were received from 3,260 unique sources, compiling a long list of 3,138 companies drawn from 50 countries. 218 companies were presented to the expert panel for final input. The end result was 100 companies from 14 countries. The 60-strong expert panel is drawn from well-respected organisations in cleantech innovation from around the world, including leading investors such as Emerald Technology Ventures, Generation Investment Management, Kleiner Perkins Caulfield & Byers, New Enterprise Associates, SAM Private Equity, Sequoia Capital, and VantagePoint Venture Partners, and from a wide variety of corporations from many different industries, such as BASF, GE, Honeywell, IBM, Procter & Gamble, Siemens, and Veolia. The complete list of 100 companies is being unveiled today at Cleantech Forum New York, http://events.cleantech.com/newyork/. Some of the companies will be showcased in New York today, others at the Guardian's Cleantech Summit in London on 23 November 2010 (http://www.guardian.co.uk/cleantechsummit). 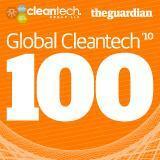 The full list of Global Cleantech 100 firms is available online, on the websites of the Cleantech Group (http://cleantech.com/GlobalCleantech100.cfm) and the Guardian (http://www.guardian.co.uk/globalcleantech100). Cleantech Group, the leading global research and advisory firm focused on cleantech innovation, pioneered the clean technology category in 2002. Today, it helps its clients make critical business decisions by providing the latest market intelligence through subscription-based research, custom advisory services, and global networking events. The company's growing international client base includes global corporations, investors, entrepreneurs, governments, and service providers. The company also produces the premier Cleantech Forum® and Focus™ events worldwide, including upcoming events in Paris, New York, Chicago, and Los Angeles. Details are available at http://www.cleantech.com. The Guardian is one of the UK's leading daily titles, and the Guardian.co.uk website delivers its liberal journalism to a global audience. The Guardian's vision is to be the leader on sustainability within the media industry. Through its editorial coverage and business activities, the Guardian demonstrates to its readers, staff, advertisers, suppliers and its communities that Guardian News & Media is committed to enhancing society's ability to build a sustainable future. Ostara Nutrient Recovery Technologies designs, builds and sells a new generation of water treatment systems -- a nutrient recovery solution that creates value from waste by removing nutrients from wastewater and transforming them into revenue-generating, environmentally friendly commercial fertilizer, called Crystal Green®. Ostara is backed by VantagePoint Venture Partners in the U.S. and Frog Capital in the UK. In 2009 and 2010, Ostara was named to the Global Cleantech 100, and recently in 2010, was named to the World Economic Forum's 2011 List of Technology Pioneers and a GoingGreen Silicon Valley Top 100 winner. For more information: visit www.ostara.com and www.crystalgreen.com.